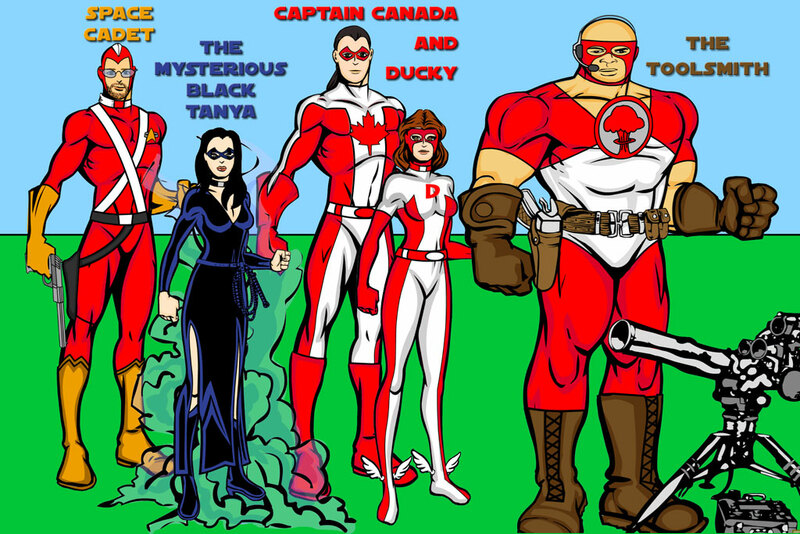 The saga of the "Team TechOps" superheroes all started when my boss, Larry, started calling one of my co-workers, Alex, "Captain Canada" because he took care of all things Canadian. 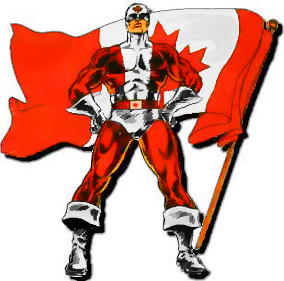 This led to someone — it may have been our VP of Operations, who is a comic book fan — to circulate a picture of Captain Canuck, one of the best known Canadian superheroes. 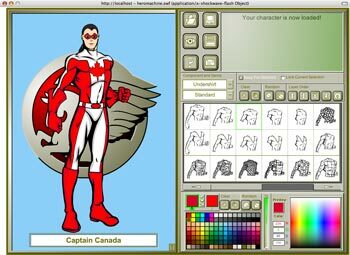 But since Larry had dubbed him "Captain Canada" and not "Captain Canuck", it seemed to me Alex needed his own costume, and since I'd recently purchased a copy of HeroMachine, that was trivial. 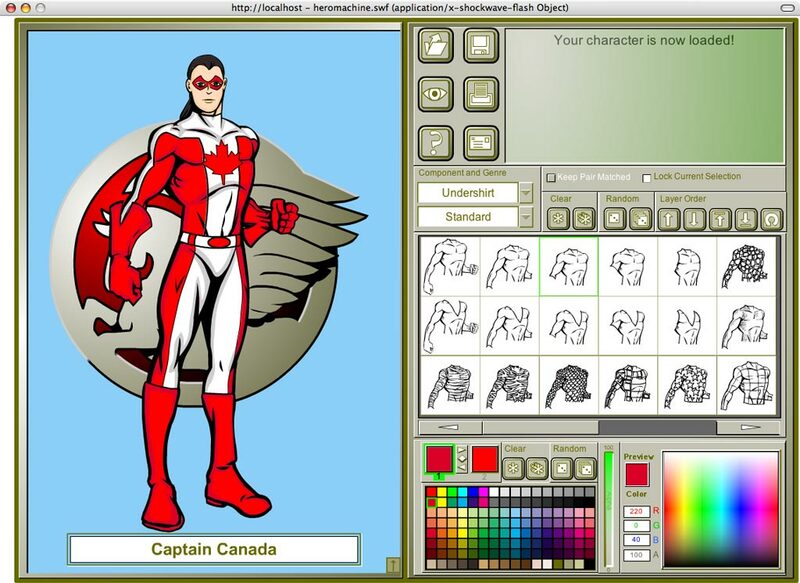 Since HeroMachine includes a maple leaf chest insignia, the costume design was pretty easy—I copied the Canadian flag, just as Captain Canuck and Alpha Flight's Guardian had. Jamil, our toolsmith extraordinaire became the team's heavy gun, "The Toolsmith", Cara made the mistake of mentioning ducks to me while I was thinking about the team, and so as Captain America has his Bucky and Batman, a Robin, Captain Canada's sidekick Ducky was introduced. Tanya, thanks to her variety of official names became the mysterious Black Tanya, and well, I've always been a bit of a Space Cadet. The new picture was sent out by e-mail within a few days. Then came Pearl Harbor Day—my second such—and corporate downsizing reduced TechOps by 3, and I inherited Canada. Cara was busy "re-metroing" the US, and so with a new Captain Canada it seemed time for a rebirth. Ducky grew up and acquired some of the elements of the Toolsmith's costume and the new identity of Ms. Metro. Given the popularity of continuity-reworking mega-cross-overs, it only seemed reasonable that Tech Two be reborn in a tie-in comic, and so, underestimating our Pearl Harbor Day losses, I dubbed our Finite Crisis "the Decimation". Our rework of Gemstar's TV Guide Plus+ into GuidePlus+ had been code named "Pegasus", and the HeroMachine logo is a winged horse, and there you have it, issue #1 of the Team TechOps revival comic from Pegasus Comics.